A couple of months ago I heard of a new line of McCormick gourmet spice packets. I am selective about who I give my business to as I prefer companies that acknowledge the "two or less" households. McCormick seems to cater to families while largely ingoring the growing community of singles and couples so I rejected purchasing the spice packets until I had a coupon. I saw a coupon for $1.25 off any McCormick product which meant that McCormick would pay ME to buy the product - I couldn't argue w/ the savings and bought the spice packet. 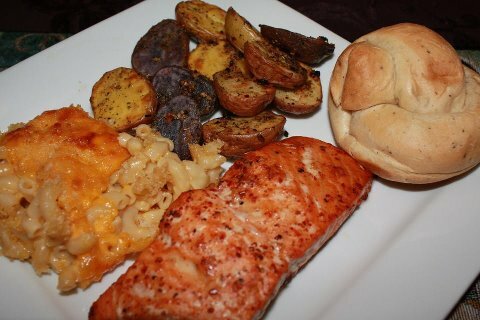 along side homemade macaroni and cheese, roasted potatoes (yes those are PURPLE, gold, and red baby potatoes!!! ), and a yeast roll Talk about a fast meal for one!